Glen Albyn is generally malty and dry, sometimes with a hint of smoke. A couple of official bottlings were released in the 1970s, then nothing until a Rare Malt Edition appeared in 2002. There have been a handful of independent bottlings, some of which have been very highly rated and show the Glen Albyn whisky brand in their true light. 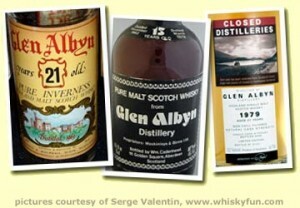 We know a couple of well known people within the whisky industry who love Glen Albyn.